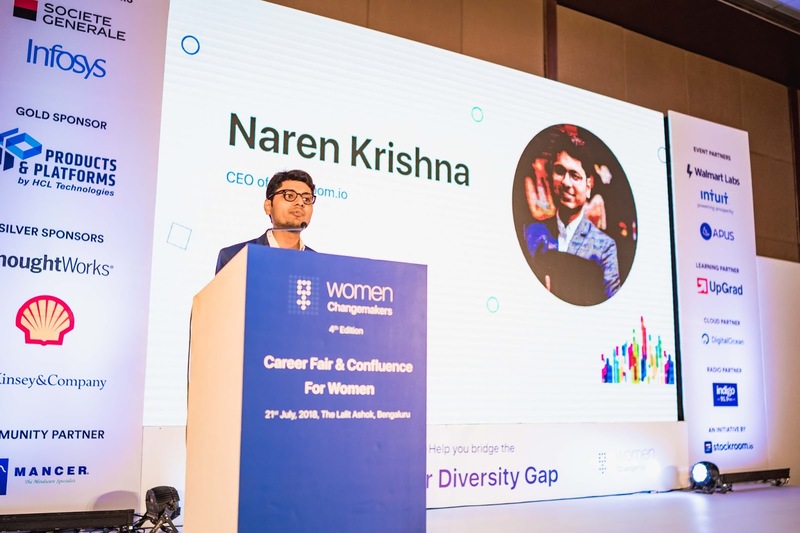 The fourth edition of Women Changemakers Career Fair and Confluence made waves at The Lalit Ashok, Bengaluru recently. An initiative of Stockroom.io, the event was an exciting opportunity for women to identify better job opportunities and understand some diversity initiatives of well-known brands. The excited participants of the Fair had opportunities to network and interact with women corporate leaders as well. Funded by Mancer Consulting Services, one of India's leading recruitment consultancy firms, Stockroom.io helps companies hire curated technology talent. Women Changemakers is an exclusive career fair and confluence for women, which is the diversity vertical of stockroom.io. At the venue, about 650 women with work experience ranging from freshers to more than 15 years’ experience, and about 100 re-starters listened to the focused discussions and used networking opportunities. The high-level speaker line up and influencers at the Fair was also a huge attraction for most participants who were looking to learn, grow and take wing in their chosen professions. Tao Li, CEO of APUS Group, who were one of the recruiters at the event said, "APUS is a strong believer of professional equality and women empowerment. In our company about 40% of employees are female, who are experts in their respective fields. We are looking forward to recruit more intelligent women who can contribute towards the growth of the company. Going with the goal of Indian government to empower women, this event is the perfect platform for us towards this big step. It is an inspiring and groundbreaking idea; we encourage the amazing talent pool in this event and wish them for their future endeavor." The other speakers were, Ashok Pamidi, Senior Director, Diversity & Inclusion NASSCOM, Tina Vinod, Head of Diversity Inclusion, Thoughtworks, Sapna Alva Tariyal, Head – Procurement , Societe Generale, Divya Ganesh, Director, McKinsey and Nidhi Goyal, Disability and Gender Rights Activist and Comedienne, Magesh Sambasivan- Head, HR, Societe Generale . The women Changemakers event also saw a unique product – Equiv, a job portal that helps companies connect with a diversity talent pool- to help with hiring and employee branding. One of Equiv’s unique offerings is the powerful AI tool that delivers text analysis tool powered by AI will help companies come up with right job description to ensure attracting more diversity applications..
With Equiv, The women Changemakers initiative of stckroom.io gets strength, added to the 4000 plus women and 25 companies that partner in this push for change.